While the growing range of e-bikes on offer is a good indication of increasing demand these state-of-the-art two-wheeled machines are pricey. So, if you’re thinking of buying one it’s definitely best not to pick one up on a whim. However, if you’re seriously considering getting a bit of battery-powered assistance when you hit the road then there’s plenty of choice. And, once you’ve decided to splurge on an e-bike the next thing to consider is what style of cycle you want, depending on your requirements. There are essentially three routes you can take: commuter, mountain or a regular-style bike that sits nicely in between those first two categories. In the case of the latter example, we’ve tried out the VanMoof Electrified S2 and X2 bikes, which are far from conventional, but we’ll get to that shortly. However, there are more standard-style bikes that make decent all-rounders, which is an area that is currently dominated power-wise by Shimano, Bosch and to a lesser extent, Yamaha. These three manufacturers provide the electric motor units that are subsequently mated to all manner of frame designs from countless bike builders, and we got to try a generic Shimano-powered Steps E6100 version ourselves just recently. But if you have specific needs then it really is worth considering a bike for a specific purpose. Let’s start with the commuter bike, which is an area that Brompton has been involved in for many years. Now though, it’s got an e-bike option to tempt you. The Brompton Electric is a hugely impressive battery-boosted version of the British bike builders’ conventional folding cycle. It’s a masterpiece of engineering which, when you initially pull it out of the box, looks a little bit intimidating, but a few minutes later, after you’ve figured out the unfolding sequence, everything falls into place and you’ve got a pretty cool bike standing there in front of you. Although the bike folds up and you can carry it, with the addition of the detachable battery pack the Brompton Electric isn’t light. Cleverly, there are two small wheels if you want to trundle it short distances. Curiously, Brompton says the bike will also double as a shopping trolley too with an optional basket. However, you really want to get on and ride it sooner rather than later. And, while it does fold up, you might find it’s a bit of a squeeze if your car is particularly small. Ditto for packed commuter trains. Nevertheless, this clever little bike gives you a real buzz as you ride it. Brompton teamed up with Williams Advanced Engineering to devise how best to power this two-wheeler and with that company’s fingers in motor racing innovation the powertrain arrangement is impressive. Even without battery assistance there’s also a Sturmey-Archer internal gear hub, augmented by a derailleur setup. All in all that means you’re armed with enough options to take on any kind of road condition, although you need to pay attention with those smaller diameter wheels and fairly narrow handlebars. There are two Brompton Electric models to choose from (a two-speed and a six-speed), and both come with the M-type handlebar and black or white finish. Brompton reckons that the 300Wh battery delivers a range of 25-50 miles and we did like the way the 250W front hub motor gave the feeling of being pulled along rather than pushed. As you’d expect, there an accompanying smartphone app that lets you keep track of your rides, bike service history and so on. You’ll need to lay down £2,595 (about $3,400, AU$4,700) with an initial £200 (about $260, AU$360) deposit to secure one. Mountain and trail bikes have come a very long way in recent years, with heaps of new innovations. Take the Merida E-OneTwenty that we tried for this feature, which comes with a Deore XT mechanical set-up and is also armed with the new Shimano Steps E7000 motor and groupset. It’s a more potent version of road-going equivalent, the Shimano Steps E6100 mentioned earlier. Honestly, these bikes are awesome. Even though TechRadar rode through a mountain range with a bunch of people who were either professional guides or bona fide bike journalists, the Merida took us to places we probably wouldn’t even normally walk to. Again, these bikes cost big money – with different model options ranging both sides of £5,000 (about $6,500, AU$9,000) as a guide – but they are the ultimate go-anywhere option. You can control everything from the handlebar setup, including gears, battery power modes and even raise and lower your saddle depending on the incline or decline. And, when you want to get back to base, these bikes work well on the roads too, with a sublime set of gears that let you power through town. You get comfort, style and the reassurance that the bikes are pretty indestructible even on the most inhospitable terrain. Indeed, we might have come home with a hole in our leg from going over the handlebars, but the bike and its innovative cocktail of construction materials and design innovations was untouched and ready to go again. One thing that was definitely noticeable with the Shimano Steps E7000 motor is that there is power, and plenty of it. While the great thing about the design is that propulsion is supplied dynamically, so you can milk as much or as little as you need from the motor, the Boost mode has real brawn. In fact, on a seemingly impossible trek up through some rocky crags the flick over to Boost proved too much and the bike ran away from its rider. Of course, this was an unfamiliar bike and surroundings, and we were inexperienced. In the right hands, or with practice, Boost mode would appear to be invaluable. And so to the VanMoof Electrified. While you can get plenty of e-bikes that come mated to the aforementioned Shimano, Bosch or Yamaha power units, the S2 and X2 bikes take things up a notch. This is a Dutch company, so the bike-building pedigree is unquestionable, which might explain why the company reckons that some 6,000 people reserved the new models without seeing or riding them. Why the rush to own one? Well, the company thinks differently, which might explain why they are attracting people with a forward-thinking outlook. "With the new Electrified, we’ve created a bike that replaces the car for city commuting. We see Tesla and BMW as competition, not other bike companies. 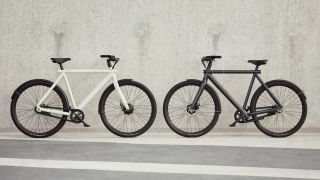 To compete at that level, we had to make everything better, faster, simpler, and more convenient," Ties Carlier, VanMoof co-founder said at the time of their launch. The VanMoof Electrified S2 certainly looks very cool and packs plenty of innovative features too. These bikes are very valuable, so one of the best things about it is its keyless stealth lock – a world-first according to the bike maker. This smart feature prevents the wheels from turning when you’re not close by, but can be unlocked with a simple touch when you return to the bike. If a truly determined thief does manage to make off with your pride and joy then there’s anti-theft tracking too. Anyone who rides an S2 will find that it also packs a dynamic ride quality, thanks to the integrated front hub motor. Power comes via a beefy Li-ON 36V battery and VanMoof reckons that it has managed to squeeze extra capacity from the new models by over 20%. Alongside performance there are smart features. Lighting is integrated into the angular frame design, while that unisex frame is a neat variation on the model that was originally only available in Japan. Another cool feature is the matrix display; with a collection of over 160 lights that bring the frame alive while also showing your speed, battery level and the amount of power-assist you’re getting. This is another e-bike that comes with a boost button, which’ll zip you up to the maximum 25km/h that the EU currently stipulates as being the assisted top end speed for these machines at present. We also like the quick charge mode, which promises to re-juice the battery by 50% in 80 minutes. VanMoof says that will get you a further 75 kilometres down the road. With a fully charged battery the VanMoof Electrified S2 has the potential to take you up to 150 kilometres in its power level one setting. In power level four, you’ll get 60 kilometres. VanMoof is taking orders on the S2 and X2 now, with deliveries beginning at the end of 2018. It also says that early bird orders will get £800 (about $1,000, AU$1,400) off the asking price of £3,198 (about $4,200, AU$5,800). A mixed bag of e-bike options then, with something for everyone and two-wheel designs that are suited to any kind of cycling scenario. We like them all for different reasons, but if we were forced to choose one then it would have to be the Merida mountain bike with that Shimano power. You might get into a few scrapes when you’re out and about on it, but it also delivers fun in spades.